For more than three decades, Karey Bresenhan and Nancy O’Bryant Puentes, founders of Quilts, Inc., have been purchasing studio art quilts for their corporate collection, mostly from exhibitions at the Houston International Quilt Festival. 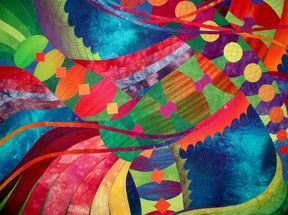 Started by Bresenhan in 1974, the Houston International Quilt Festival quickly became an international destination for quilters from around the world. For the first time ever, part of this collection has been assembled into a nationally-touring exhibition. Dr. Sandra Sider, Curator for the Texas Quilt Museum, selected the twenty-five quilts in the exhibition, which date from 1994-2008. The artists range from several of the most famous names in contemporary quilt art to emerging artists at the time of purchase whose innovative work caught the collectors’ attention. Themes and styles in this exhibition include narration, color abstraction, landscapes, the cosmos, and homage to antique quilts.